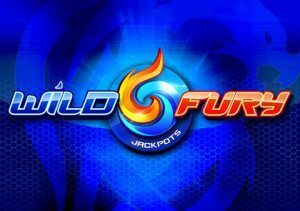 IGT has once again turned to its live casino catalogue for another online video slot release, Wild Fury Jackpots. It’s a 5 reel, 10 payline game that comes with stacked wilds and a bonus round that awards up to 100 free spins. Collecting wilds increases what an already guaranteed jackpot prize. Stakes range from between 10p and £100 per spin. The visuals in Wild Fury Jackpots are just what we’ve come to expect from one of IGT’s brick and mortar conversions. It’s flashy, shiny and easy on the eye. Joining the 6 lower value gemstone symbols are fire and ice dragons and fire and ice lucky 7s. Both of the latter pair offer awards of 1, 3 or 10 times your bet if you land 3, 4 or 5 in combination. Appearing on all 5 reels is the flaming fireball wild. This performs all the usual substitution functions as well as offering payouts of up to 50 times your bet per payline. Better still, the wild spins in a fully stacked formation and can fill whole reels. The other symbol is the dragon’s tail which is the scatter. Land 3 of these on the same spin and you’ll activate the Free Spins Bonus feature. You’ll be taken to a new screen. Spin the bonus wheel – this will determine whether you’ve been awarded 10, 15 or 20 free spins. There’s plenty of scope to add to these figures though. Level Up and Double Level Up symbols can appear on reel 3. When they hit, they take you up the jackpot levels and the prizes on offer increase. You could land up to 10 Level Ups throughout the feature which can have a big impact on the potential prizes – getting 100 or more wilds could pay out up to 2,000 times your bet! You’re guaranteed to win something here. Wild Fury Jackpots is a relatively simple game but it comes together rather well. It’s easy to see why it was a hit with brick and mortar players. It’s not especially volatile. The variance is in the low to medium range but the stacked wilds and jackpot prizes on offer in the free spins round make Wild Fury Jackpots worth a closer look. If you want something with more of a backstory, you cannot go wrong with IGT’s Solar Disc.